Until the First World War, when rising land prices and lack of manpower ravaged the industry, South West London was famous for its vast fields of lavender. Lavender had been used for centuries in England as a perfume, a medicinal herb, and in cooking, and both Queen Elizabeth I and Queen Victoria were fans. 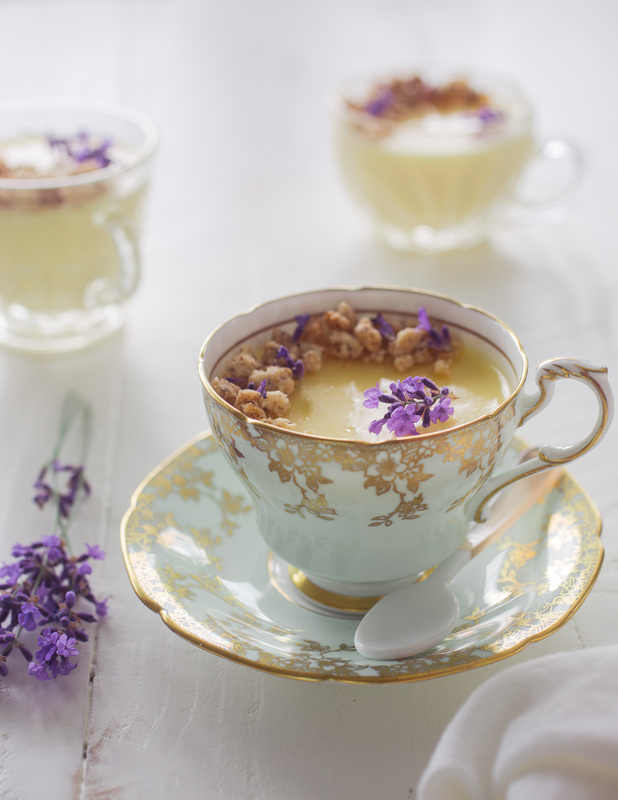 So it seemed appropriate to include lavender in a posset, an old English dessert in which cream is heated and then slightly curdled with acid, in the form of citrus juice or wine, so that it sets. While a lavender shortbread would pair perfectly with this decadently creamy dessert, I took that idea in a slightly different direction by topping the possets with a lavender hazelnut shortbread crumb. Using a stand mixer, cream the butter and sugar together until soft and fluffy. Stir in the hazelnut flour, all-purpose flour, lavender, and salt to create a crumbly mixture. Don’t work it into a dough. Place a sheet of parchment paper on a baking sheet and spoon the crumbles onto the paper in a thin layer. Bake for 15 to 20 minutes, until golden brown and crunchy. Cool completely, then crumble into even smaller crumbs with your fingers. Store the crumbs in an airtight container for up to a week. Bring the cream and sugar to boiling point in a small saucepan, stirring to dissolve the sugar. Add the lavender. Remember that the boiling point of cream is much lower than that of water, so take care that it doesn’t boil over. The moment it starts to bubble vigorously, remove the saucepan from the heat, add the lemon juice, and stir thoroughly. Allow the mixture to cool in the pan for around 15 minutes. Strain to remove the lavender. Pour into 4 ramekins or glasses. Chill until set, about 4 hours, and decorate with the lavender hazelnut shortbread crumbs and some fresh sprigs of lavender. And enjoy free home delivery!